How many resumes do you think you currently have in your inbox? How many have you received this year alone? It’s a big number, isn’t it? Let’s be honest, filing them away, saving them to your desktop or uploading them to your ATS can be a bit tedious. 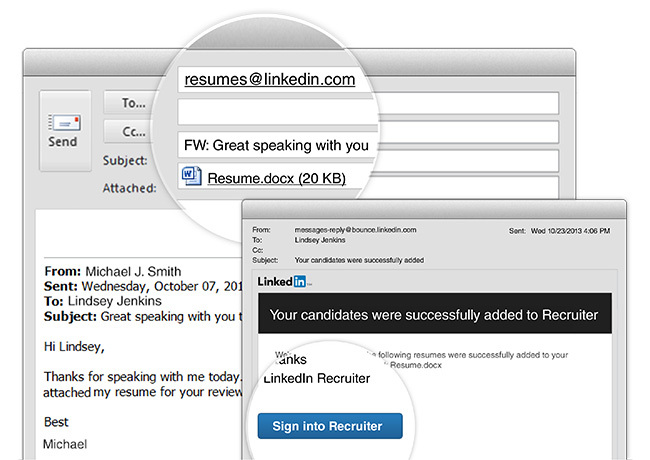 That’s why we created a new way to upload resumes directly to Linkedin Recruiter simply by sending an email. The next time you receive a resume in your inbox, simply forward it in a .pdf, .doc, or .docx format to resumes@linkedin.com. The resume will automatically be added to Recruiter and matched with the candidate’s LinkedIn profile. If they don’t have one, a new Recruiter profile will be created with information from their resume – like name and current company (and of course, the resume will be attached). This profile will exist only in your instance of Recruiter, not on LinkedIn.com, and will be visible only to your team. We’ll then send you a confirmation email so you know it all went off without a hitch. The next time you log in to LinkedIn Recruiter, you’ll see the import confirmation and link to the prospect’s profile so you can view the newly imported resume. The resume will always be attached to the prospect’s profile, so you’ll know just where to find it. Learn more here or simply try it out today by forwarding a resume to resumes@linkedin.com. To use this feature you must have Talent Pipeline activated on your Recruiter account, which your administrator can do from the admin screen within Recruiter.